1G. Ellinas is with the Department of Electrical and Computer Engineering, University of Cyprus, Nicosia, Cyprus (e-mail: georgios@ucy.ac.cy). 2A. Gebreyesus-Hailemariam is with Planning and Engineering, Fulfillment and Service Assurance, Qwest Communications, Boulder, Colorado, USA (e-mail: Aklilu.Gebreyesus@qwest.com). Ring architectures have been widely used by telecommunications carriers for the deployment of networks based on synchronous optical network (SONET) and wavelength division multiplexing (WDM). These architectures have several attractive properties that make them desirable for a large number of applications. Even though arbitrary mesh network architectures provide additional degrees of freedom and are more flexible than rings, in a number of applications there are advantages to decomposing the mesh topologies into a set of rings that cover the network. One of the primary uses of ring covers is to provide survivability against link and node failures. 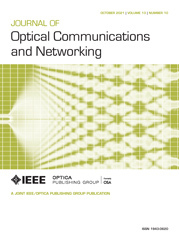 This paper investigates novel approaches for establishing ring covers in optical networks with mesh topologies, while minimizing the length of the ring covers.